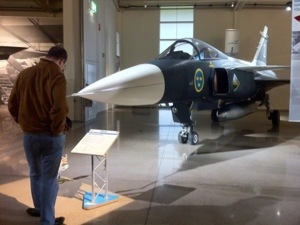 Today we went to the Swedish Air Force Museum. A co-worker of mine recommended it to during my first week at work and I thought it was a perfect thing to do during my first weekend here in Linköping. They have three show rooms. The first with different types of aircrafts throughout the history. For some of the planes in this showroom it was possible to use a QR reader in order to get an audio guide for the specific plane you looked at. QR is a really clever little thingy. No need for renting a MP3-player or similar. As most people have a phone and thus the possibility to download their own QR app doing it this way is so neat. The second showroom depicted the happenings during the Cold War and how it affected Sweden. 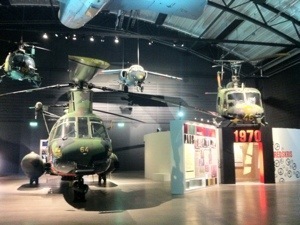 The different types of aircrafts used by the Swedish air force were hanging in the roof. Each decennium, 1950 through the 1980, had information about the major treats, what happened and how people and governments behaved/reacted was shown. Each little room also had an apartment in the style of that particular decennium including showing news on a TV and popular music. In the third showroom was a new exhibition that won the price of the exhibition of the year in 2010. Here was information about the DC-3 which was shot down in 1952 by The Soviet Union. Not until in the early 90’s did they official acknowledge that they had shot down this plane and that the plane indeed had been over international waters. Lots of information has been classified for years about what the plane actually were doing, and what happened. In 2003 a private team finally found the plane and a year later it was salvaged from its location 126 meters below the surface. The plane as well as other artifacts, including private items from the 8 men on the flight, were shown. It was a little dark in this area so I didn’t take any pictures. In 2011 the museum got the award of museum of the year. They have truly done a great job with this museum so I understand their recent awards. Apparently the reopened after a remodel in 2010. 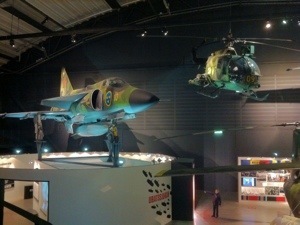 If you’re ever in the Linköping area I recommend that you go for a visit to the Swedish Air force museum!